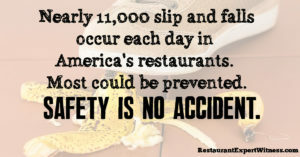 Nearly 11,000 slip and falls occur each day in America’s restaurants; that’s around 4 million each year. These slip and fall incidents cost the hospitality industry over $2 billion each year and these injuries are increasing at a rate of about ten percent annually. Most of these slip, trip, and fall incidents could be avoided. What are you doing in your restaurant in regards to slip and fall prevention? Slips, trips, and falls can happen in the dining room, kitchen, buffet area, parking lot, entryway, restrooms, stairways – anywhere on the premises. Many times they happen while employees are working around ice bins where ice can easily fall onto the floor forming puddles; working in busy, congested areas; walking or running on slippery or uneven floor surfaces; carrying dishes around blind corners or stairs, and using single door entry to and from the kitchen area. Slips, trips, and falls are often a result of failing to follow proper floor cleaning procedures, such as not following instructions on cleaning product labels, using the wrong cleaning agent for the flooring surface, not properly rinsing the cleaning product after scrubbing, using dirty or insufficiently maintained equipment and tools, not posting proper warning signs, or failing to schedule cleaning in a timely fashion. A great number of these slip, trip, and fall incidents are preventable by restaurant management keeping safety top-of-mind and a major priority. Management must create a safer and healthier environment for all employees and guests by developing, implementing, maintaining, and providing ongoing training of an industry standard slip and fall protection program (written operating policies, practices, and procedures). It is Restaurant OSHA Safety and Security and restaurant industry standard for management to not only develop and implement a slip and fall protection program, but also to commit to providing ongoing training of the program to employees, and further, to evaluate the program on a regular basis to ensure the program’s effectiveness and determine whether the program needs to be changed, revised, or updated in some way to make it more effective. To find out more about Howard Cannon’s book, Restaurant OSHA Safety and Security, The Book of Restaurant Industry Standards & Best Practices, or to purchase a copy, CLICK HERE.